I have been trying to get to Medlock Ames for a couple of years. It is a tiny bit out of the way of our usual path, but I could feel it in my bones that we NEEDED to get there. We were not disappointed. The tasting room director is just wonderfully cheerful, knowledgeable and helpful. 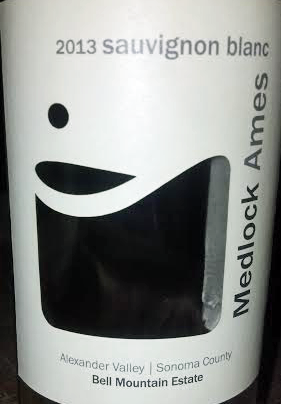 It was a really nice day and we chose to be seated outside on a beautiful patio and began the Medlock Ames tasting adventure. I will begin gushing in a second but first of all I think it’s important to relate that M-A is completely organic, sustainable and all the building materials are repurposed, including the building which used to be a general store and bar. There are tours available at the actual estate where the grapes are grown and I will definitely make time for the tour next time. Okay on the the wines. They are masterfully crafted and so distinct honoring the grape to it’s full potential. I was struck at the smoothness and deliciousness of the wines. I will feature the Sauvignon Blanc today and review the others as we revisit them. Sauvignin Blanc can have different personalities depending on how the grape is grown and handled. Sometimes I believe it is misunderstood and the full flavor is not as developed as would be ideal. Ames really gets it and their SB is exquisite. Mouth watering guava and other tropical fruits with the crispness of citrus greet you upon first approach and then you get that silky mouth feel, with a lasting and aromatic finish.